At first glance, the Revan game-to-novel conundrum looks like the same situation as the Commander Shepard game-to-movie adaptation of Mass Effect. Both situations involve taking a player-controlled Bioware character and bringing them to a non-interactive medium, which means a single defined personality is necessary for the main character. It’s easy to fear that the vast, vast majority of fans will be upset that the Revan in the novel is not their Revan. Upon closer inspection, however, having a single defined Revan is far, far more understandable than a single defined Shepard, and it’s all because of Revan’s backstory. As a Dark Lord of the Sith before the players even get their hands on him, Revan already had a personality that was defined. Details about what he believed as a Sith are alluded to in both KotOR games, the timelines for SWTOR, and even the Darth Bane novels (written by Drew Karpyshyn, writer for KotOR and the Revan novel). He was not an empty slate until his memory wipe, an event mentioned in the timeline videos. The Revan you control has no memory of his past, so Revan as you play him is not exactly the same person as the Dark Lord of the Sith. They can almost be seen as two different entities: Darth Revan and Player Revan. As learned in Knights of the Old Republic II: The Sith Lords, Revan began to recover his memory after the events of the first game. When a man loses his memory and lives years as a new person, then begins to recover memories of his old life, who is he? Who is Revan after the events of KotOR? He is a blend of Darth Revan and any light-sided male Player Revan you play in KotOR. Neither alone can define him, but both combined let us see his personality. Dark-sided KotOR Revans and female Revans unfortunately miss out in this novel (and no doubt the Revan elements of SWTOR, too) since Star Wars canon has Revan has a light-sided male. Light-sided male Revans likely represented the majority of players, though. Drew Karpyshyn’s defined Revan simply makes sense. It’s really a perfect opportunity to satisfy the vast majority of players. When Revan in the novel does something that your Revan would do, you can interpret it as influence from your Player Revan. When he does something out of character for your Revan, you can interpret it as influence from Darth Revan. The same goes with what we learn from Revan in The Old Republic, no doubt. Want examples? Let’s look at a few lines from Revan, taken from Star Wars Insider’s August edition. 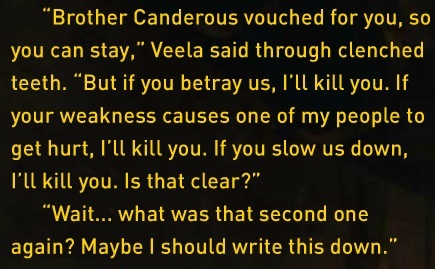 It shouldn’t be surprising, since Drew Karpyshyn is both lead writer of KotOR and author of Revan, that this sounds like a dialogue choice in KotOR. It’s the kind of thing the player would be able to say to T3 if kindness was the goal (but “At least you aren’t completely useless, droid” would likely be an option, too). While some KotOR players may not have admired the Mandalorians, Revan is remembering how he felt during the Mandalorian Wars, which means this line makes perfect sense. It doesn’t conflict with any player choices because it states his feelings before the events of KotOR. If you chose options like, “Is losing lightsabers a side effect of your Battle Meditation?” when you played KotOR, you’re well versed in the game’s smartass choices. This line feels like it was taken right out of the game. With no way to satisfy every KotOR fan, it seems that Revan will do an incredible job at pleasing the majority. All Revan needs is a proper balance of respectful lines and sarcasm; readers will be able to appreciate the elements of their Revans that live on in the canon Revan of the novel. If you want to see the full excerpt of Revan, you can buy the digital version of Star Wars Insider Issue #127 on Zinio. You can also preorder the novel on Amazon. What are your hopes for Revan’s character in the novel and SWTOR? Do you think he will feel enough like your Revan? 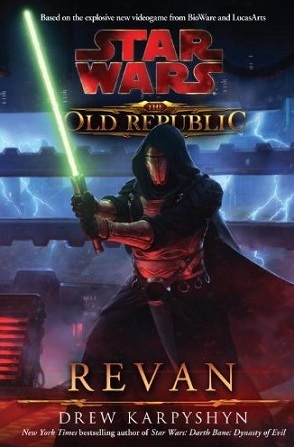 Well ive read over a hundred fan fiction stories on “Revan” male/female dark/light why should I even buy this book ? The reason for the book is two-fold, one it is Drew Karpyshyn’s character and he wanted to finish up the story, and secondly the writing of this book it makes the story have the Revan character as now a canon figure with history etc. This is like is the same reason why Marvel wrote an actual origin book for Wolverine. The Revan book, like the origin book for Wolverine, sets up one story line that now other things can now be build upon for future things like mentions in SWTOR for instance. Just my thoughts what do you think? I always thought of his facemask and the black clothing as being something he put on after turning to the Dark Side so it seems a little odd to see him with a green saber wearing that garb. The “Mysteries of KOTOR” trailer a while back showed four people running the instance so I’m guessing Revan won’t be an endgame raid and it heavily inferred this was something for Imperial players with the quest giver saying the team would get the “first crack” at the tomb. Taral V’s mysterious 300 year old prisoner has got to be someone from KOTOR and so perhaps that’s the Republic equivalent with Revan being the detainee. @James: Jason’s post pretty much answers your question. Not only is this the story that KotOR’s Lead Writer is telling, but it’s also the canon Revan storyline in the Star Wars universe. If you’re a Star Wars EU fan, that might be important. If you’re going to play SWTOR, Revan is going to be involved in some of the non-class-specific content. He’s going to play a role, meaning that this Revan’s story is the true one in many important ways. @Jason: Definitely. Bioware may be able to keep things ambiguous, never messing with anyone’s choices, in the Mass Effect and Dragon Age universes, but that’s because they own those universes. Star Wars is different, and Bioware certainly isn’t the only group playing in Lucas’s sandbox. They need to lay down a canon Revan storyline so that other writers can mention it, build upon it, etc. @Freeware: Yeah, it’s interesting to see why Revan is still wearing his Darth gear, yet wields a green lightsaber. Symbolism? Maybe we’ll find out in the novel! 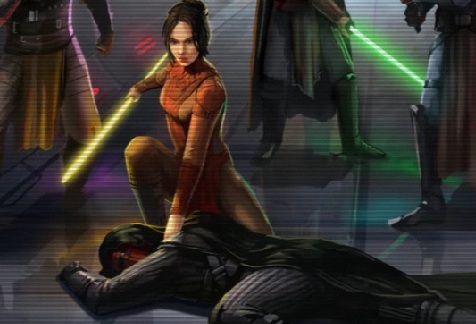 And yes, I expect that a good chunk of the Revan storyline will be involved in those Flashpoints. We’ll no doubt see other parts, and many KotOR references, throughout different parts of the game, too. Actually Revan has the armor and mask while a Jedi. He had same armor when he was Sith as well. So its only make sense he have the armor that he always had with him. I hope the Noval and SWTOR does Revan justice.